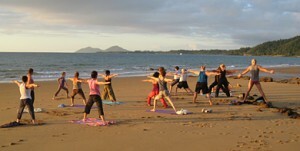 Mission Beach is in the heart of the Wet Tropics in North Queensland. With travel times approximately 5.5 hours door to door from Sydney and with return airfares from as low as $300, it’s a Paradise not far away. As you would expect, all the attractions of the tropics are able to be experienced at Mission Beach. From secluded rainforest-fringed beaches with sparkling clear water to island cruises and diving trips to the Great Barrier Reef or for the thrill seekers, white water rafting on the Tully River. At Sanctuary, guests can enjoy the tranquility of the beautiful forest pool, a massage or wander the short walk through the forest to a near private beach. Walking trails wind through the rainforest, where guided night walks can show you how it comes alive after dark. Conveniently located within Australia without the stresses of international travel, Sanctuary offers an exotic tropical rainforest experience far away from everyday life but without being far away from home. To help make your retreat successful we can help with our co-operative advertising program as well providing a free link on the well-ranked Sanctuary Yoga Upcoming Retreats page. To help make the organising of it stress-free, we can take enquiries, bookings and payments on your behalf, leaving you to concentrate on what you do best: Teach great Yoga Retreats. 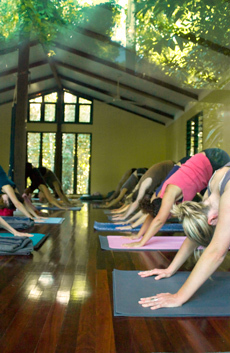 For more information on the above and other compelling reasons as to why you should hold your next Yoga Retreat at Sanctuary, please click here. Sanctuary is a very special and unique place in many ways. We want to provide a clear, honest picture of Sanctuary, so we request that you consider a few points that will either enhance or detract from your participant’s expectations. Read more… Finally, we hope that you found the links to discover what Sanctaury can offer to create your own unique Yoga Retreat. Please don’t hesitate to contact us if you require any further information. 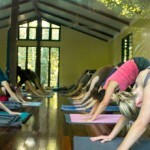 We look forward to discussing with you how Sanctuary can help with hosting your next Yoga Retreat.